POLITICAL leaders have given a mixed reaction to the voter ID scheme trialled at the local elections in Woking earlier this month. Voters across the borough were required to show an approved form of photographic identification before receiving their ballot paper at the polling station, as one of five pilot schemes carried out around the country on 3 May. 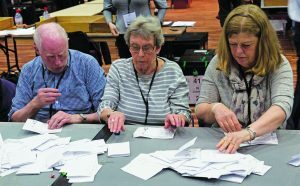 With only 51 people denied a vote due to a lack of ID, compared to 18,800 who successfully cast their ballot, Ray Morgan, the council’s chief executive and returning officer, called the trial a great success.